It has excellent original paint with some old hunter touch up around the neck and around an original factory crack on the back. It does have some old varnish drips on the back that cannot be seen in the pictures. Mason Decoy Company, Excellent Original Condition in Original Paint with the Hunter's Brand on the bottom. 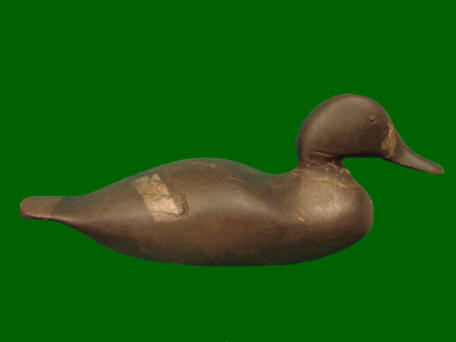 This decoy is in worn original paint and has a repair to the neck. Jasper N. Dodge, Detroit, Mi. Ca. 1880's Second Generation Tack Eye Red Head Dr. Duck Decoy. This is a nice example with very good original blended paint and a mellow patina. It has some wear through the paint under the tail and on the right front of the breast. The neck filler looks original but is probably replaced. There is some original factory filler missing from a knot on the left side of the head.